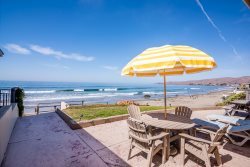 Located across the street from the beach access, this newly remodeled home offers convenient access to downtown Cayucos. It is walking distance to the pier, restaurants and locally owned shops. The open floor plan features a bright and airy living room, dining area and fully stocked kitchen. Skylights and ceiling fans are featured thoughout the house . There are 3 bedrooms,and 2 fuidll baths on the main level. The master bedroom has a Cal King bed and private bath with large walk-in shower. The second bedroom has a Cal King bed. The third bedroom has a queen sized bed.The hallway bathroom has a shower/tub combo. Shower heads are placed up high. Upstairs is a family room that features a Pull out queen sofa sleeper, a television and 1/2 bath. There are several large ocean facing windows and a slider that opens to a large, sweeping view deck. There is an outside shower for your convenience upon returning from the beach. *garage not available for parking.